General manager John Dorsey believes the prime-time games give the country a chance to see the fans’ passion for Cleveland Browns football. The Buffalo Bills poked fun at Cleveland Browns quarterback Baker Mayfield and their other opponents in their 2019 schedule release video. Following the emergence of Baker Mayfield and acquisition of Odell Beckham Jr., the Cleveland Browns' 2019 schedule isn't short on high profile matchups. Cleveland Browns general manager John Dorsey believes Duke Johnson Jr. is a ‘very talented football player’ and looks forward to having him on the team this season. 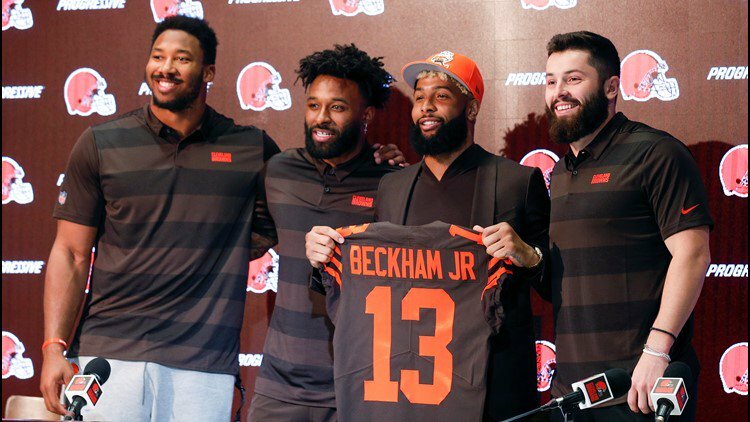 General manager John Dorsey wants to fortify this ‘whole thing’ and build competitive depth for the Cleveland Browns in the 2019 NFL Draft. Cleveland Browns GM John Dorsey addressed the media in Berea one week prior to the start of the 2019 NFL Draft. Cleveland Browns GM John Dorsey is set to address the media one week prior to the start of the 2019 NFL Draft. The Cleveland Browns will be featured in four primetime matchups in 2019, their most since 2008. Being scheduled for four prime-time games during the 2019 season is a ‘tip of the hat’ to Cleveland Browns quarterback Baker Mayfield, GM John Dorsey.